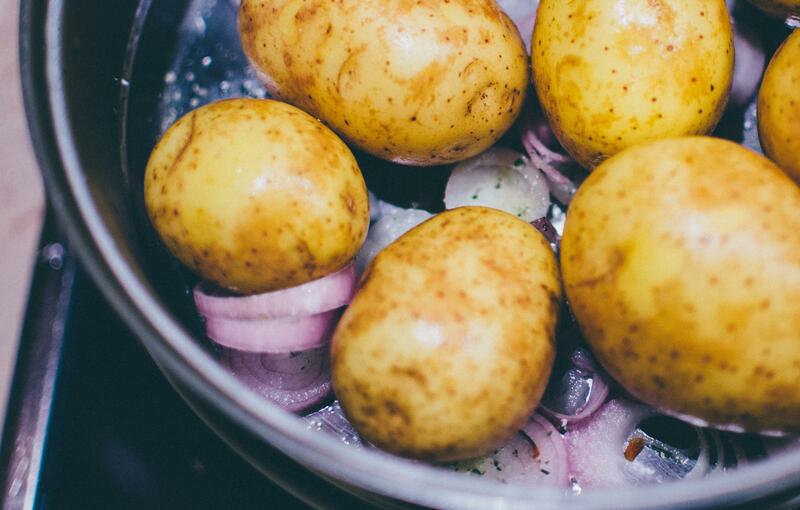 Allow to cool in pan for 30 minutes then gently remove…they will be soft. Store in air tight container and refrigerate for longer storage. 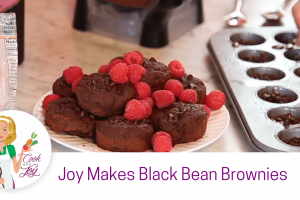 I’m not a huge dessert person but my friend, Beth, is and she swears by this recipe. She runs a bootcamp program and likes being able to give her students some options for healthy treats. I love that this recipe is pretty simple and doesn’t need any adaptation to make it vegan and gluten free. 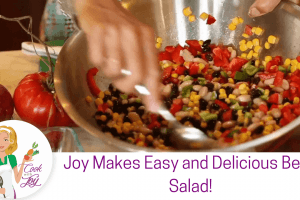 Anytime I can get beans into my diet, I’m happy…this recipe does that! Black beans give us an excellent source of protein and fiber and, unlike other types of beans, have a significant amount of Omega 3’s. Optional flavorings like Vanilla extract, Cocoa Powder, Cinnamon, etc. Use a powerful blender to pulverize the frozen and dried fruit, adding liquid slowly, to get the desired consistency. 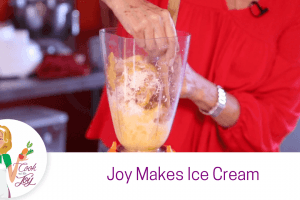 Served right away, it will have a softer consistency but freeze a bit to get more of the “scooped” ice cream feel. This would be delicious with fresh berries on top. 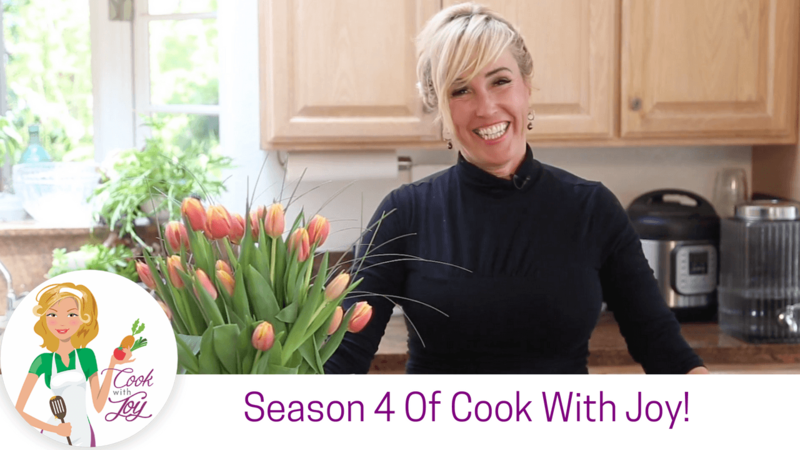 In this episode, I used frozen and dried mango, coconut flakes and coconut milk but yo should experiment to get the flavor and consistency you desire. Many folks like to use frozen bananas as a base for their creamy texture that gives an end product more similar to ice cream. Adding citrus (lemon, lime, orange, etc.) will give more of a sorbet taste and feel. Oh, my gosh! I grew up with that little ditty as a REAL thing…every day! Although we didn’t have much money growing up, we always seemed to have one of those giant plastic buckets with vanilla ice cream in the freezer and I had a big bowl of ice cream almost every day! Maybe you also have an ice cream habit and even though you eat a pretty healthy diet, this is your one weakness. And you probably like “really good” ice cream, right? Not the stuff in the plastic bucket. Can’t be that bad for me, right? Well, consider this: half a cup of premium ice cream contains between 17 and 25 grams of fat, depending on the flavor and brand you choose. 1 slice of cooked bacon contains between 3 and 4 grams of fat. That means when you have ½ c of ice cream, you are basically eating the equivalent of up to 6 slices of bacon. And lets get real: who stops at ½ a cup? Most of us consider the little pint-sized containers it comes in to be 1-2 servings…. you do the math! This is a super easy recipe to make, especially if you have a high-powered blender, which I recommend for every well-equipped kitchen. I personally like Vita-Mix but there are several good ones out there. 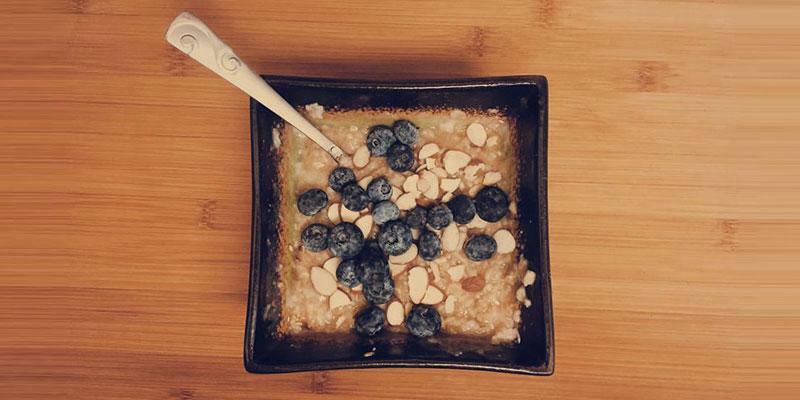 Try your own version of this simple recipe and get your friends and family involved. Find your favorite twist and adopt a whole new “ice cream” habit! Most folks prefer the scramble with nice big pieces in it. It’s crumbled, yes, but not completely in crumbles. Just kind of torn apart and then broken up a bit when cooking in the pan. Garlic, some cumin, a little thyme – that is the base. From there you can do countless variations using whatever is in your fridge that morning. In this episode, I used mushrooms, tomatoes, spinach, peppers and avocado. First stir the spice blend together in a small cup. Add water and mix. Set aside. Preheat a large, heavy bottomed pan over medium high heat. Sauté the garlic in olive oil (or just water) for about a minute. Break the tofu apart into bite-sized pieces and sauté for about 10 minutes, using a spatula to stir often. Get under the tofu when you are stirring, scrape the bottom and don’t let it stick to the pan, that is where the good, crispy stuff is. Use a thin metal spatula to get the job done, a wooden or plastic one won’t really cut it. The tofu should get browned on at least one side, but you don’t need to be too precise about it. The water should cook out of it and not collect too much at the bottom of the ban. If that is happening, turn the heat up and let the water evaporate. You can include these additions to your scramble by themselves or in combination with one another. All of the veggies add more nutrition, taste and variety of textures to the dish. Broccoli – Cut about one cup into small florets, thinly slice the stems. Add along with the tofu. Red Peppers – Remove stem and seed, finely chop one red pepper. Add along with the garlic and cook for about 5 minutes. Proceed with recipe. You can also roast them first and then add with tofu. Mushrooms –slice or chop about a cup of mushrooms. Add along with the tofu. Carrots – Grate half of an average sized carrot into the scramble towards the end of cooking. This is a great way to add color to the scramble. Saffron will also do it. Avocado –Just peel and slice it and serve on top. 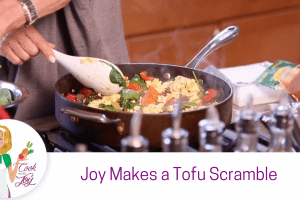 Scrambled tofu is one of the most mundane vegan recipes there is. 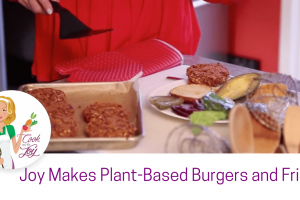 But for anyone experimenting with plant based eating, it’s one of the most important dishes to learn. For many, it’s a staple. You don’t have to stop at breakfast, or limit yourself to a plate of scramble and hash browns Here are a few ways to spruce up your scramble, or use up your leftovers. Serve in a squash bowl: Serve in half a baked squash. Caramelized onions would be nice, too. Make a sandwich: A scramble sandwich with avocado, red onion and sprouts. You can read more about the health benefits of tofu in my Thanksgiving Faux Turkey Breast recipe. Here are just some of the health benefits of the veggies I used, but as I said earlier, the variations are endless! Tomatoes contain lycopene. Lycopene is a powerful antioxidant & scientific research has found a link between lycopene & lower levels of certain cancers. Lycopene has also been found to be beneficial to the heart & blood vessels, skin, & bones. When tomatoes are cooked, as in this rendition, the lycopene levels are higher & easier for the body to absorb. Other vegetable toppings contain nutrients that promote better health.. Onions contain chromium & vitamin C, & can help regulate blood sugar, blood pressure & cholesterol. Bell peppers contain high levels of antioxidants & vitamins C, B6, & A, which help keep cells healthy. 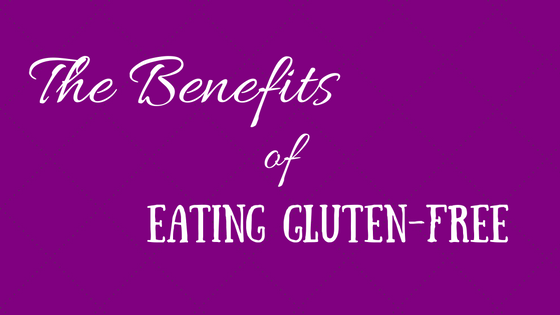 These vitamins also support the immune system, metabolism, digestive health & good vision. Mushrooms contain zinc, riboflavin & potassium, all necessary for many important functions in the body & help keep the central nervous system healthy. Combined, these nutrients go a long way to protect your heart & prevent disease. Place the dates and almonds in the bowl of a food processor fitted with the steel blade. Process on high until it resembles a crumbly, sandy texture. Add in the remaining ingredients and process until a dough begins to form. Take 1-2 tablespoons of dough in your hands, gently roll the mixture into balls. Enjoy immediately or store in a sealed container in the fridge or freezer. Note: These can also be made into bars by pressing the dough into a square baking pan lined with parchment paper, then placing the pan in the fridge to set for about 30 minutes. Remove the parchment paper and slice the mixture into bars. Again, store these in an airtight container in the fridge or freezer. Many of us CRAVE treats! Many of us CRAVE chocolate! 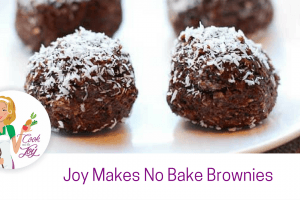 This recipe is so great because it satisfies AND is actually good for us! 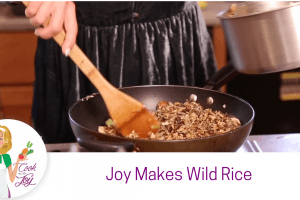 There are several different variations of this recipe, some involve grains, seeds, etc. I will probably feature them in the future…stay tuned! There are actually many health benefits associated with chocolate! Aren’t you glad? The secret is to not get all the other stuff many chocolate candies include. What’s in your fridge? Put it in! Onion & Garlic, of course! Some travelers come to a village, carrying nothing more than an empty cooking pot. Upon their arrival, the villagers are unwilling to share any of their food stores with the hungry travelers. Then the travelers go to a stream and fill the pot with water, drop a large stone in it, and place it over a fire. One of the villagers becomes curious and asks what they are doing. The travelers answer that they are making “stone soup”, which tastes wonderful, although it still needs a little bit of garnish to improve the flavor, which they are missing. The villager does not mind parting with a few carrots to help them out, so that gets added to the soup. Another villager walks by, inquiring about the pot, and the travelers again mention their stone soup that has not reached its full potential yet. The villager hands them a little bit of seasoning to help them out. More and more villagers walk by, each adding another ingredient. 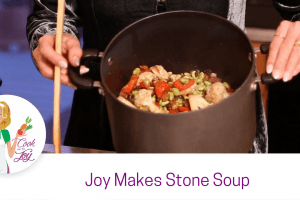 Finally, the stone (being inedible) is removed from the pot, and a delicious and nourishing pot of soup is enjoyed by all. Although the travelers have thus tricked the villagers into sharing their food with them, they have successfully transformed it into a tasty and nutritious meal that they share with all the donors.